High Court Quashes Bledisloe Consents! Justice Venning's decision on Urban Auckland's judicial review application has been released at 4:00 today. 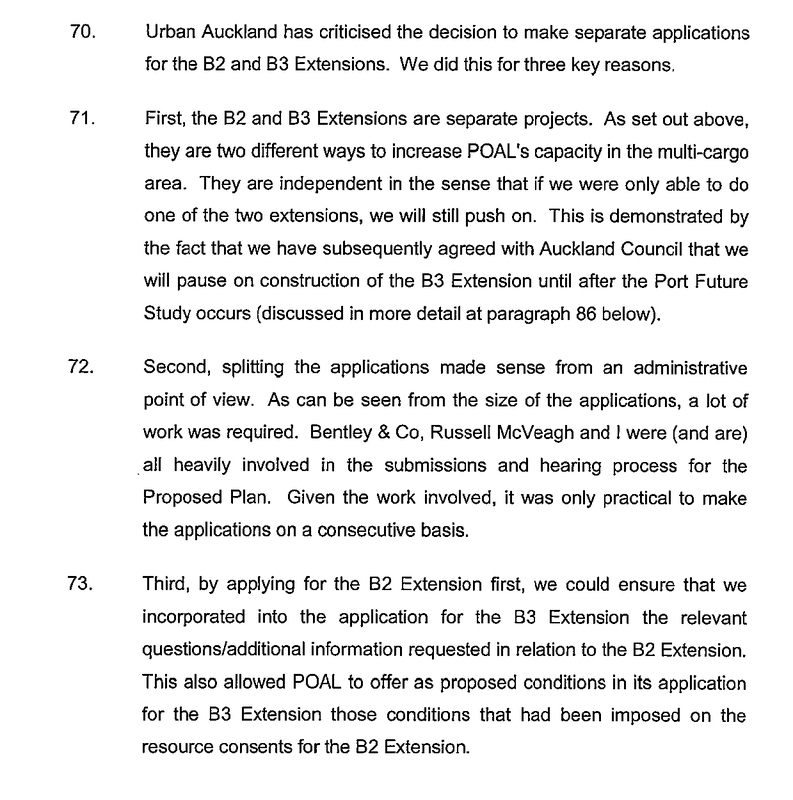 Recall that Urban Auckland argued that the consent applications to extend Bledisloe Wharf (B2 and B3) should have been notified, and also that the various consents that made up each of these applications should have been bundled and decided together (among other things). (a) The applications for consent should have been bundled which would have required notification, as the most restrictive activity was a discretionary activity. The adverse effects identified by Urban Auckland will fall to be considered. (b) Alternatively, special circumstances existed which required notification in this case. The Commissioners fell into error in determining that because the extension was a controlled activity and an expected development no special circumstances existed so that it was unnecessary to notify in any event. The consents issued on a non-notified basis are set aside. Mr Farmer then made a number of submissions emphasising the cost and commercial imperative in this case and the effect on third party contractors. I accept the significance of that to the POAL. He also referred to a number of matters which have been discussed above and submitted that there would be little point achieved by notification. However, the same reasons which support notification in this case, also support the grant of relief. I accept there would be no point in setting the consents aside and requiring notification if there is no purpose to it, but for the reasons given above I consider there will be purpose. It may well be that ultimately the consents are granted but that should follow the proper process contemplated by the RMA on the facts of this case. To the extent that there will be further delay and cost to POAL it has to a degree brought that on itself in the way that it urged the Council to proceed on the non-notified basis in the knowledge of the reaction that was likely to engender. In doing so it took a commercial risk in proceeding in that way. The cost and commercial imperative in requiring notification is a significant factor, but it cannot override the legal requirement for non notification which the Court has concluded is applicable in this case. A great result for the public of Auckland, and for public participation. The decision from Justice Venning is expected sometime this week in the matter of the High Court Judicial Review proceedings triggered by Urban Auckland in regard to the lawfulness of the B2 and B3 Bledisloe Wharf extension consents. This posting provides access to some of the evidence that was provided to the Court. I provide highlights here extracted from selected affidavits, and links to the original affidavits (in some cases without their exhibit annexures - because of problems of space!). 15. 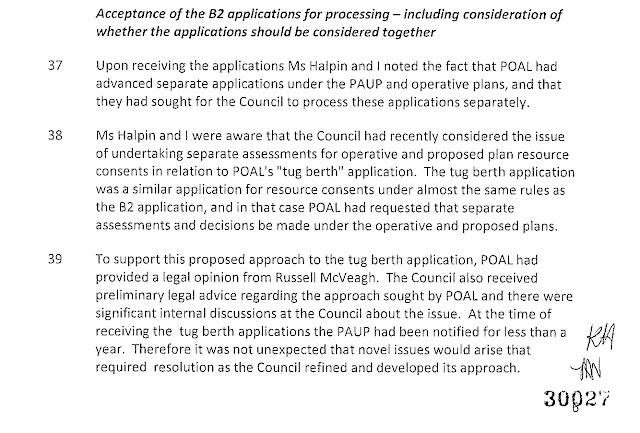 Ms Halpin says the B2 and B3 extensions will be “barely perceptible”. I disagree with this analysis. The impact is obvious from a simple “before and after” of the B3 extension on Queens Wharf (Annexure 3). Once constructed, B2 and B3 will jut out into the harbour. Both structures (especially B3) will affect public enjoyment and appreciation of waterfront spaces and the amenity values of the Harbour for all Aucklanders. 16. POAL provided no visual assessment of the B2 and B3 extensions from public viewing points. Ms Halpin did no analysis and sought no independent assessment to substantiate her position of a “barely perceptible” effect. The decisions by Commissioners Macky and Kaye to approve B2 and B3 contain no detail on visual and amenity effects to the waterfront. This is surprising to me considering that they had to be satisfied that the effects on the environment of the extensions would be no more than minor. 17. In my experience as an architect, a site visit is essential to assess potential visual and amenity effects. There is no evidence that Ms Halpin or any other report-writers visited the site and its’ surroundings to view the impact, before writing their reports. Commissioners Macky and Kaye appear not to have done a site visit either (by reference to their Duty Commissioner record sheets (attached and marked “JS4”)). 18. The visual and amenity effects of the B2 and B3 extensions will be significant. Another part of Auckland’s vista over the waterfront from public spaces will be lost. A further step in POAL’s well-known plans for reclamation (Exhibit JS3) will be taken. All this will be done without any scope for public input. 19. Urban Auckland will, as part of these proceedings, commission additional expert landscape evidence (Mr Gavin Lister) to demonstrate the kind of information that Council could (and should) have required when assessing the visual and amenity impacts of the B2 and B3 extensions. See the full affidavit here. 20. The end of the B3 extension will intercept the line-of-sight to Devonport Wharf (i.e. Victoria Road Wharf), blocking views of the water beyond this line. It will effectively block views of the eastern end of the harbour, the harbour entrance, and the outer Waitematā. 21. The B2 extension by itself would extend roughly half way across the current view of the harbour entrance. 22. The B3 wharf extension will also enclose Queens Wharf within a basin so that the current experience of the harbour proper will be lost. Queens Wharf’s prominence as the principal axis between main street and harbour will be weakened. 23. Such effects will be caused by the wharf structures themselves, but will be exacerbated by any cargo stored on the wharfs and ships berthed at the wharf extensions. 24. To explain it another way, the worst place to build a new structure in the port precinct in terms of visual effects from Queens Wharf is the location of the B3 extension. 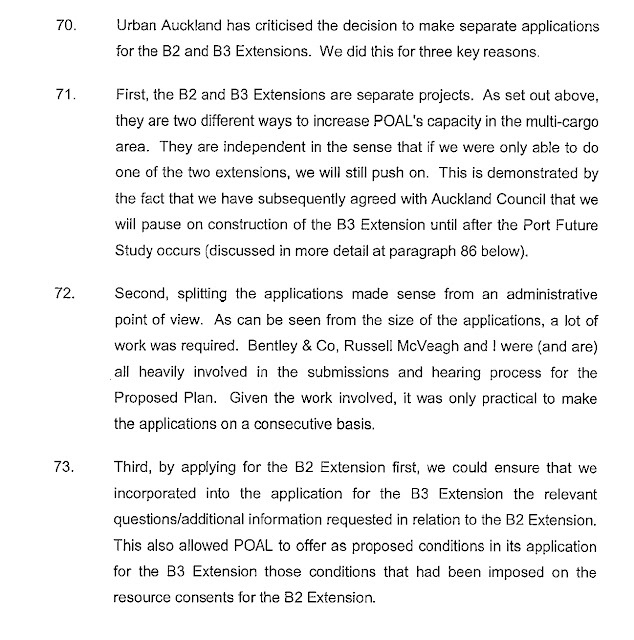 The B2 extension also adversely impacts views from Queens Wharf, although the effect is not as pronounced as B3. 46. Where more than one activity is involved and those activities are inextricably linked, the general rule is that the activities should be bundled and the most restrictive activity classification applied to the overall proposal. 47. Splitting the proposal into its separate applications for the purposes of notification and assessment of effects could lead to the unsatisfactory outcome that the Council fail to look at a proposal in the whole and do not consider possible interrelated or cumulative effects. Integrated management (looking at all consents jointly) is especially important in the coastal environment from my experience. 48. In this case a number of resource consents are required under three separate regional plans: two operative and one proposed. 49. The applications have been separated out by POAL into separate applications, not just in terms of different aspects of the activity under the Coastal Plan and ALW Plan, but also in respect of the operative regional plans (Coastal Plan and ALW Plan) and the Proposed Plan. 50. The most restrictive of these consents requirements is that of a discretionary activity. 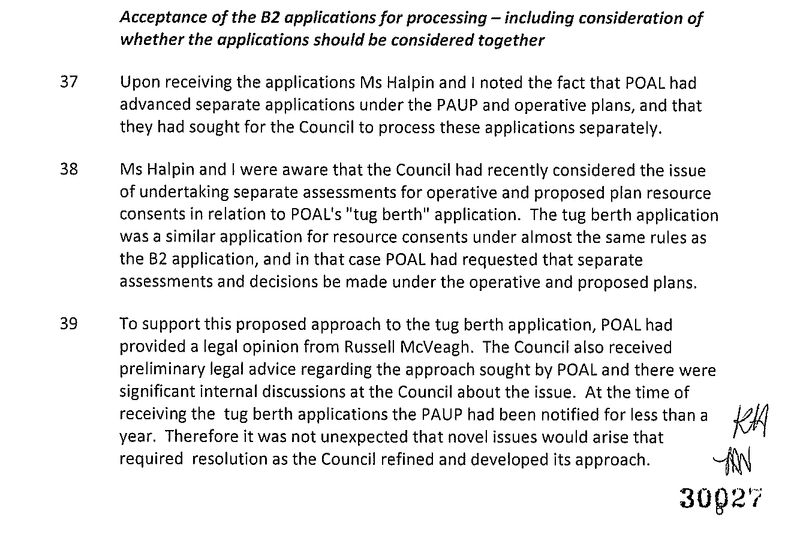 However, this consent status is effectively ‘siloed’ from the other consent requirements for the same structure by the approach requested by POAL (via Bentley), and acceded to by the Council processing officers. I refer here to the splitting of the B2 application into the separate B2.1 and B2.2 applications. The same approach is also adopted for the B3 application. 9. One of the understandings arising out of the development of the Proposed Unitary Plan was that the inner harbour is the key open space in the central city, and I would suggest an extension of this principle to conclude that the wider harbour is the defining open space of Auckland. The viewshaft linking these two parts of the harbour from what will become the city’s landmark viewpoint at the end of Queens Wharf demands urgent protection. 10. I have examined the photo-images prepared by Gavin Lister in his affidavit depicting the visual impact of the proposed extensions from both Prices Wharf and Queens Wharf. I confirm they accurately depict the blocking of the views from those viewpoints, and in particular the blocking of the view from the end of Queens Wharf of the harbour beyond Devonport toward the south as a result of the proposed extensions. 11. I consider the proposed wharf extensions have significant negative visual effects on the important public view from Queen Wharf to the wider harbour beyond Devonport, and that urgent action is required to halt the extensions and to protect the view. 5. The focus of this affidavit is on the issue of special circumstances, as these apply to Ports of Auckland Ltd’s (POAL’s) expansion within the waterfront and inner Waitemata Harbour. 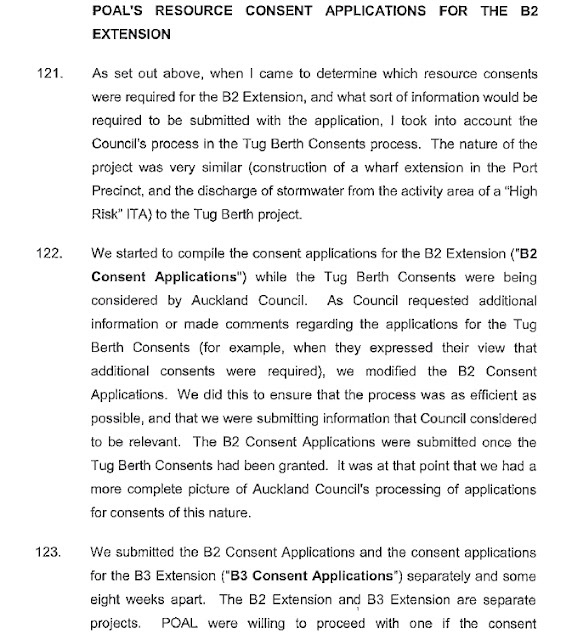 My understanding is that Council had the opportunity to publicly notify the B2 and B3 resource consent applications to extend Bledisloe Wharf, on the basis of “special circumstances”. ‘Special circumstances’ is undefined but responds to context, and involves unusual but not necessarily unique circumstances where it is appropriate to have public input. 6. The Committee’s position is that there are special circumstances and the B2 and B3 applications should have been publicly notified. There is a great deal of public debate, and policy work, that has been done in relation to future and best use of POAL’s occupation of the inner Waitemata Harbour. The Committee has actively participated in this debate, and has prepared several reports highlighting public interest in the very issue of extending POAL’s footprint into the Waitemata Harbour. Auckland Council and POAL are well aware of this debate, ongoing for a number of years. It is therefore a matter of surprise that special circumstances were not considered to exist. I produce below two reports prepared by the Committee, which speak to the public policy debate on POAL’s expansion plans. 20. There is no mention that the new impervious surfaces would be extensions of existing wharves into the Waitemata. 21. It is obvious that the larger the wharf extensions, the greater the likelihood of impacting cultural sites, waahi tapu or other taonga. All iwi groups consulted would have relied upon POAL’s assurance. It is therefore of great concern that B2 and B3 (in combination) exceed the 3500m2 “additional impervious surface area”. If construction of B2 and B3 is allowed to proceed at this time, then POAL will be in breach of an important assurance given to Ngati Whatua Orakei and other iwi, both as to the extent of new surfaces and an understanding that new wharves, or extensions to existing wharves, were not involved. 22. As noted, consultation was limited to stormwater impacts of potential structures within the Port Precinct Area and how this might be mitigated through the TP10 standard. POAL did not disclose that other resource consents were required to construct structures in Port Precinct Area 1A. POAL did not consult on construction effects and opportunities for improved public access, including Captain Cook Wharf. Ngati Whatua Orakei has a policy of encouraging public access to its whenua at Orakei Marae and Takaparawhā. We would expect to be consulted on opportunities for improved public access, for example, to Captain Cook Wharf. This could include improved access by mana whenua (and tangata whenua) for cultural practices. 23. Consultation requires good faith discussions. Sufficient information must be provided by the consultor (POAL) so that the party being consulted (Ngati Whatua Orakei) can provide informed consent. POAL must have known about its intention to apply for the B2 and B3 extensions, as part of its overall plan for expanding the Bledisloe Wharf. It did not disclose those extensions. Had it done so, Ngati Whatua Orakei would have clearly identified the adverse cultural effects of doing so and would have required further information from POAL. Full affidavit for Ngarimu here. 25.4.7 Maintaining or enhancing the landscape and amenity links between the harbour, the port and adjacent areas, including the Central Business District. 26.6.1 That the ARC will liaise with Auckland City Council and Ports of Auckland Ltd on issues associated with any future development or expansion of the ports in Port Management Areas 1A and 1B, to encourage consistent management across administrative boundaries. 26.7.2 Maintaining liaison between the ARC, Auckland City Council, and Ports of Auckland Ltd complements the objectives, policies and rules and is important because of the potentially significant cultural, social, economic, and environmental implications of port expansion for the port company, the downtown area, and the Auckland Region. 4.4 This recognises the significant social and cultural implications of port expansion for Auckland, the downtown area and the port company itself, and in my opinion is a clear policy signal that any expansion proposals advanced without evidence of Council liaison will need careful assessment, including for notification purposes, and particularly the special circumstances notification discretion. 4.5 In that regard, I consider there were four obvious special circumstances that at least needed detailed evaluation (which did not take place) in the context of considering how to process the applications (i.e., notified or non-notified). 4.6 The first of these relates to the fact that Queens Wharf had been brought into public ownership (like Wynyard Quarter), but without any plan change that would have allowed the implications of that change in ownership and status to be reflected in the Auckland Regional Plan: Coastal. 4.7 For example, as noted above in the Matthews and Matthews Heritage Assessment of Queens Wharf and Sheds which advises: “Views from along the centre of Queens Wharf back to Queen Street and towards the Waitemata harbour are important.” I consider that a plan change would likely have protected this view shaft. The heritage assessment notes that in relation to its landmark quality, Matthews and Matthews advise: “Queens Wharf occupies a prominent position when approaching Auckland and the ferry terminals from the harbour.” Again, this suggests that being able to see Queens Wharf and its structure while approaching from the water is another view that needs some form of protection or recognition. This is a special circumstance that did not exist until the study had been carried out and which was triggered by the purchase of Queens Wharf. 4.8 The second special circumstance relates to the fact that Queens Wharf, as noted in the chronology above for December 2010, was listed as a Category 1 Historic Place by Heritage New Zealand. It is likely that the Historic Places Trust would have been treated as a potentially affected person in relation to any activity that would potentially affect the heritage character and amenity of Queens Wharf, if this matter had been identified and considered. In any case such a significant listing should be regarded as a special circumstance leading to notification in my view. 4.9 The third special circumstance relates to the fact that it appears from the chronology that POAL and Auckland Council were clearly aware that POAL’s intention was to infill between B2 and B3 in order to achieve an objective that it has articulated consistently since 1989 - to expand Bledisloe Wharf north by reclamation, and that B2 and B3 extensions were clearly a means to that end. 4.10 The fourth special circumstance is that Council, in recognition of overwhelming public concern expressed over port expansion plans in the last 3 years, had adopted the non-complying rule for reclamation in the draft Unitary Plan. This surely was an indication that there was very significant public interest in any development that would enable, or be by itself, an expansion of Bledisloe Wharf into Waitemata Harbour. It was surely a good reason to notify these consent applications – preferably together, but at the very least one at a time. These affidavits and Urban Auckland's Statement of Claim were responded to by POAL and Auckland Council. 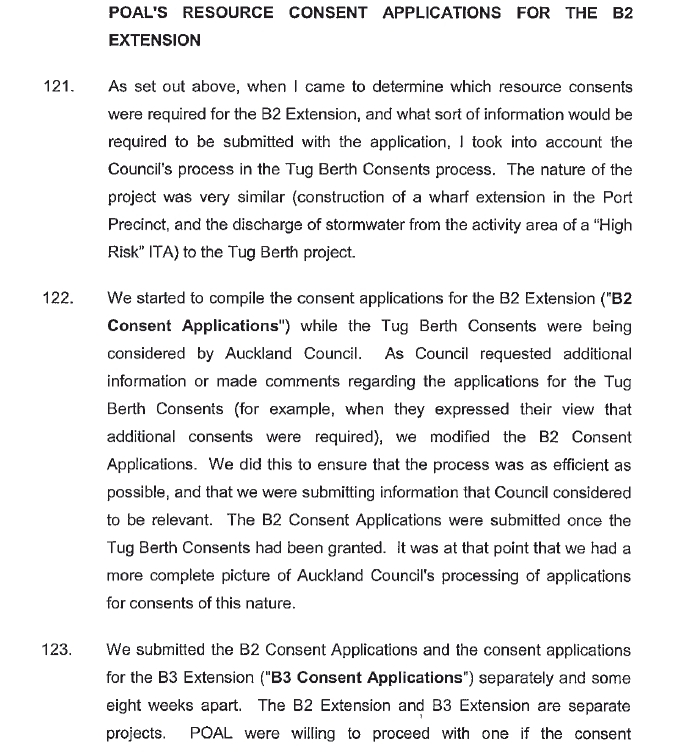 Auckland Council provided affidavits from Jennifer Valentine the main officer responsible for processing the B2 and B3 resource consent applications, and also from the two independent commissioners engaged to decide the applications. Full Jennifer Valentine affidavit here. Full Kirk affidavit here (minus exhibits). Full affidavit of Mark Arbuthnot is here. It has been a very interesting process. Urban Auckland's team ended its role in the process by filing affidavits in reply to those from Auckland Council and Ports of Auckland. I'll end this with an extract from my reply. 8. At paragraph 102 Mr Kirk states: “Queens Wharf was released to enable its development as a cruise ship terminal and as fan zone for 2011 Rugby World Cup, not for its public views. Queens Wharf remains an operational wharf and access is restricted when cruise ships are berthed…”. I was an Auckland Regional Councillor at the time ARC allocated $20,000,000 to purchase its 50% share of Queens Wharf and I attended all of the related Council meetings and public occasions and do not agree with this statement. For example it is a matter of public record that the northern end of Queens Wharf cannot now be used to berth ships in recognition of the need to provide for unrestricted views and for recreational fishing and other activities, and that these public activities continue to be available even when a cruise ship is berthed at Queens Wharf. And so it goes. You can see my reply here. The judicial review court hearing largely revolved around the legal submissions prepared by and for the QC's who acted as Counsel for Urban Auckland, POAL and Auckland Council. I will give some consideration to posting those submissions at a later date. However the written versions of these submissions - while they are of interest and comprehensive - don't necessarily portray the main arguments taking up court time and attracting interest and debate between Counsel and the Judge, though they are on the table - along with the evidence - as the judge writes his decision. We await the decision with interest. This essay is student work submitted this semester by Ning-Wei Kuo, during study for the Urban Planning 100G Course administered by The School of Architecture and Planning, University of Auckland. Theories of planning and ideas around the subject have evolved for centuries. Patrick Geddes, one of the significant characters in this field, devoted his life and contributed his view on city and planning. He had three different perspectives on the evolutionary theory of urbanism being developmental, evolutionary and environmental. (Batty, Marshall 2009) We will examine his ideas with close attention and determine his influence and impact on today’s planning world. Patrick Geddes’s perspective of developmental city was influenced by other planners such as Ebenzer Howard on the idea of metaphorically describing cities as living organisms. (Batty et al, 2009:551) This is an interesting interpretation because of the characteristics of organisms. It is a natural process for an organism to grow and become mature. Cities will grow when planners execute constructive plans well. The maturity of the city might be indicated by population growth and strong economic activities. Additionally, as organisms will grow old and perish, cities will also vanish if they are not taken good care of by the planners. Perhaps, the substantial difference between real organisms and the metaphorical organisms (the cities) is their life span. Unlike the eventual fate share among all the real organisms, cities seem to be able to continue its existence infinitely. Additionally, Patrick Geddes was also influenced by his surroundings when he was in his childhood. (Goist, 1974) He was interested in observation which induced his curiosity and became more aware of the interaction between animals and plants as well as the environmental settings. (Goist, 1974) This helped Geddes to reaffirm the idea of cities as metaphorical organisms. The mutual dependence and inseparable relationship between animals and plants is exactly the same in terms of humans and cities. Furthermore, Geddes suggested that the city should be planned in the manner which responds to the needs of the inhabitants. (Goist, 1974) It is particularly important because if the needs are not fulfilled, the inhabitants will be left with two undesired options. They will need to relocate themselves to a place which is able to meet their needs or they can stay where they currently are and perish because their needs are not fulfilled. In either case, the city will vanish as outlined above. The fact that Geddes established the first student hostel in Scotland proved he understood the need of the society and he planned the city in this way to meet the demand. (Goist, 1974) Therefore, the idea of planning around human needs again highlights the solid interconnection between humans and cities. Patrick Geddes believed it is more beneficial for humans and cities to cooperate rather than compete with each other. (Batty et al, 2009) The planners need to construct the city well for mankind to thrive. In the similar context, there is no city without residents. This reinforces the idea of mutual dependence and inseparable relationship between humans and cities. Arguably, cities are not real living organisms. They are unable to initiate changes themselves but to be shaped according to the plans. In this instance, Darwin’s theory seems to be more appropriate as if cities passively evolved. Nevertheless, cooperation is still a crucial element in the process of evolution. In additional to his evolutionary belief, Patrick Geddes referred urban renewal as performing conservative surgery. (Henderson, 2003) He illustrated his idea through his works on “rehabilitating tenements and removing dilapidated houses.” (Goist, 1974:32) The primary goal for this conservative surgery is to preserve the community and the environment. (Rubin, 2009) He also valued the idea of small changes are capable of creating big effects. (Goist, 1974) This is a critical thinking because often people resist to changes. It increases the uncertainty and sometimes makes people feel vulnerable. However, by introducing small changes and progress, the effect will build up to be enormous in the long term. People will also be more likely to adapt to these minor changes more smoothly. The third perspective from Patrick Geddes on the evolutionary theory of urbanism is environmental, which Geddes considered the city in the context of environment rather than as organisms. (Batty et al, 2009) This is the extended idea from Darwin’s theory of natural selections. Geddes implied that through a better design of the city, the society lives within the city will be positively affected. (Batty et al, 2009) It is evidential that organisms will be forced to adapt to new environments. Thus, by providing a much more comfortable environment will make living easier to the organisms within this environment. Enhancing the quality of life is a goal that Geddes tried to achieve, (Mercer, 1997) and it should be the common goal for all planners. In order to achieve this vision of better life for everyone living in the community, Patrick Geddes believed firmly on conducting surveys before starting to plan. (Mercer, 1997) This is essential as the effort will be meaningless unless these plans contribute positively to serve the purpose of providing better life. He acknowledged this idea by setting up his “Sociological Observatory and Sociological Laboratory,” in the Outlook Tower in Edinburgh. (Mercer 1997:215) This is the place where he performed his researches and surveys. We are thus able to understand the importance he placed on this idea of survey before planning. Sustainable development is the idea of satisfying needs in the present without being at the expense of sacrificing the ability to meet these needs in the future. (WECD as cited in Brown, 2006) From this definition, it is a clear message that not only the planners are responsible for protecting the interest of future generation, but also we need to increase our awareness on our consumption behaviours. We would like to have our future generation to enjoy this world as much as we do. To conclude, we have examined the ideas of Patrick Geddes. He understood the city as organisms and believed in the theory of evolution. Furthermore, he perceived the city as environment. Even though he was influenced by many other people, he still introduced a lot of original thinking such as conservative surgery and valued the importance of understanding needs before planning. The treasure he left to us is the perspective of city as environment which developed into the idea of sustainability. Overall, we appreciate his contributions and it is important for future planners to continue his vision of a better life for everyone. Batty, M., & Marshall, S. (2009). The evolution of cities: Geddes, abercrombie and the new physicalism. TPR: Town Planning Review, 80(6), 551-574. Brown, D. F. (2006). Back to basics: The influence of sustainable development on urban planning with special reference to montreal. Canadian Journal of Urban Research, 15, 99-117. Goist, P. D. (1974). Patrick geddes and the city. Journal of the American Institute of Planners, 40(1), 31-37. Henderson, H. (2003). Founding father. Planning, 69(1), 49. Mercer, C. (1997). Geographics for the present: Patrick geddes, urban planning and the human sciences. International Journal of Human Resource Management, 26(2), 211-232. Rubin, N. H. (2009). The changing appreciation of patrick geddes: A case study in planning history. Planning Perspectives, 24(3), 349-366. This essay is student work submitted this semester by Andrew Robilliard, during study for the Urban Planning 100G Course administered by The School of Architecture and Planning, University of Auckland. Following the widespread construction of industrialised cities within the nineteenth century, the twentieth century brought with it a major change in the fields of architecture and planning. This occurred through the response towards public outcry regarding the substandard living conditions of urban centres at this time, an opportunity for a new type of city became apparent. Fuelled by the new political ideology of the time, a desire for a more fair representation of social justice, the designs for these new cities often favoured fairness and equality over ease of business; as had previously been the case. At the forefront of this development, Le Corbusier performed the majority of his most famous works throughout this time. Despite only a relatively small number of his projects reaching fruition, Le Corbusier remains an important figure of the time, and vital to the development of urban planning as we know it today. Born in Switzerland as Charles-Edouard Jeanneret-Gris on October 6, 1887, Le Corbusier first began his career in architecture and planning upon moving to Paris in 1917. Initially practicing as an architect under government contracts, Le Corbusier spent much of his free time painting (Bio, 2015). These early artworks clearly demonstrate his ordered and compartmentalised way of thinking, with geometry featuring prominently in his paintings. His 1924 painting ‘Still Life Filled With Space’ shows these ideas particularly well. With it being described as a prime example of purism. The artwork sought to represent precision and balance of man-made materials (Art Institute of Chicago, 2015), and how this concept can allow for basic shapes to contribute to an overall sense of beauty and completeness. Great parallels can be drawn between this early work and Le Corbusier’s more elaborate plans for urban centres, such as Chandigarh, India, his Ville Contemporaine (Contemporary City) and La Ville Radiouse (The Radiant City). These plans were heavily influenced by a sense of symmetry and equality surrounding all aspects of his designs. This equality extended to all aspects of his concept, with his plans for his Radiant City moving away from the recognition of socioeconomic class. This ideology can possibly be attributed to his early depiction of equilibrium throughout his works, potentially indicating a more socialistic mindset in his later years. The foundation of Le Corbusier’s designs for urban centres revolved around his proposed concept of Immeubles-villas. This housing concept, which is evidently quite similar to modern apartment buildings, involved a large collection of cell-like abodes. The closed ‘estate-like’ residences originally comprised of 5 floors. Hanging gardens and large parks were prominent features of the final design. Once again indicating a socialistic approach to urban structure, every resident of the building was allocated and even portion of space, with all of the necessities available within the structure (Le Corbusier Foundation). Fuelled primarily by Le Corbusier’s own desire to improve the living conditions in the slum neighbourhoods of Paris at the time, many plans involving Immeubles-villas included the demolition and removal of large low-lying houses from urban centres. This made way for modern high density accommodation, while maintaining a superior standard of living to what was previously available. Unallocated space was often assigned as parks or green space, following Le Corbusier’s desire to reimplement greenery into the modern city (Fishman, 1982). The building block structure of Le Corbusier’s design is made abundantly clear, simply through the existence of such a comprehensive ideology of his perfect domestic residence. With the basic structure of his humanity oriented city in place, these building blocks of an idealistic society can be assembled in such a way as to create an urban centre that echoes these values. Extensive similarities can be drawn between this ideology and modern methods of planning urban centres, with numerous examples evident in documents such as the city wide Auckland Plan. In documents such as this, a unified plan is constructed based on fundamental ideology, which is then attributed at the most basic levels of the surrounding society. Auckland can then develop inline with these concepts, much like Le Corbusier’s completed city designs did. “Man walks in a straight line because he has a goal and knows where he is going” This statement made by Le Corbusier upon the publication of his designs for Ville Contemoraive, or The Contemporary City, effectively summarises the overwhelming idea in this plan, as scene is dominated by straight lines. In this proposal, Le Corbusier compares someone who walks with purpose to a man, while those who are meandering and distracted are not dissimilar to pack-donkeys (Le Corbusier, 1987). The allusion to his confidence in his own proposal is obvious, with Le Corbusier’s ordered and logical thinking evident throughout. His own criticisms of industrial cities are littered throughout, with the disorder playing a central role in the cause of his distaste. While the rigid and unnatural structure of these designs are often criticised, the concept Ville Contemporaive presents numerous benefits to the people of the city. The dense city centre provides adequate housing and recreation options for those working within the area. This compact plan also drastically reduces the need for inter-urban transport systems, as each area is provided with acceptable resources to exist independently. Another benefit of the close proximity is that it allows for cheaper infrastructure costs. In concept, the design has no obvious complications. The close proximity allows for mass distribution of resources to the population, while allowing for an improvement in lifestyle over the industrial city of the time. However, the construction of the plan was limited by both the resources to create such an experiment, as well as the location in which to do so. Following the submission of his initial design, Le Corbusier then presented his second unrealised plan in 1924, and published it in 1933. Ville Radieuse, or The Radiant City, was somewhat of an extension of The Contemporary City, with a more comprehensive plan being completed. This new plan included designs for integrated transport, as well as an even greater emphasis on green space and natural light (ArchDaily, 2013). Within this plan, as a result of his desire for specificity and order, Le Corbusier established the process of zoning. One that is now in widespread use today. This was used to limit the spread of any particular type of building so that they did not encroach on any other area of the city, which is identical to zoning in modern times. With certain areas being marked for certain purposes, the city can remain true to Le Corbusier’s vision, even after buildings or areas are removed or replaced. In a radio broadcast conducted for The Museum of Modern Art, Le Corbusier compares The Radiant City to a well oiled machine (Le Corbusier, 1935). From this we can infer that he is in fact discussing this concept of zoning as was previously described. In Le Corbusier’s eyes, with the rigid and comprehensive regulations in place, a well planned city could remain intact and true to its purpose for centuries, simply because it remains uncorrupted and suitable for its original function. Once again, similarities exist between this ideology and many modern urban plans, as a desire for long lasting and profitable cities currently exists due to its logical presence in our society. Modern thinking is often analytical and logic based, allowing us to draw more parallels between our ideal society and Le Corbusier’s more than ever before. The final and most recognisable city plan created by Le Corbusier is that of Chandigarh, India. Unlike his former plans, Le Corbusier’s master plan for Chandigarh was more natural and tangible, therefore leading to its eventual construction at the request of India’s first Prime Minister, Sh. Jawahar Lal Nehru. The needs of the people again played a central role, with the concepts of living, working, care of the body and spirit, and circulation of people appearing as the four major disciplines within the city (Chandigarh & National Informatics Centre, 2014). Originally designed to be an agricultural city, designs included taking advantage of the surrounding fertile land and maximising proximity to nearby rivers. The urban centre’s proximity to the nearby foothills also provides a rain shadow, as shown by topographic maps of the area (topographic-maps.com, n.d.) The consideration of natural features has allowed for Le Corbusier to create a functional city that is able to exist with supporting infrastructure and a suitable, planned source of regional income. This in itself provides a greater sense of depth and plausibility compared to his previous designs, and likely was a major contributing factor into the final construction of the city. In some ways this makes Chandigarh the most relevant of Le Corbusier’s works, as it emphasises the importance of the consideration of the natural environment into the designs of an urban centre. A blank canvas is never available, therefore a holistic design remains crucial to the planning of a city, regardless of time period. As an important figure in the emergence of the Urban Planning profession, Le Corbusier played an important role in establishing the modern planning conventions that we have in place today. From his designs for The Contemporary City, The Radiant City, and Chandigarh, he teaches us the importance of balance in the design of an urban centre. While an ordered and regulated structure is required to provide a sense of purpose, an understanding of the landscape and the natural environment is also paramount to the successful implementation of a city. From this we learn that Le Corbusier’s greatest legacy is in fact this concept of balance, as it perfectly explains the complexity and insight required for a condensed urban society. The ideas of Le Corbusier continue to influence the planning of our cities today, and will likely be relevant for some time to come. Fishman, Robert. (1982). Urban Utopias in the Twentieth Century: Ebenezer Howard, Frank Lloyd Wright, Le Corbusier. Massachusetts: MIT Press. Le Corbusier. (Narrator). (1935, October 24). La Ville Radieuse [Radio Broadcast]. In The Museum Of Modern Art, Woman’s Radio Review. United States of America: WEAF—NBC. Le Corbusier. (1987). The City of To-morrow and Its Planning. Massachusetts: Courier Corporation. Maxwell Fry, E., & Drew, J. (1955). Chandigarh and Planning Development in India. London: Royal Society for the Encouragement of Arts, Manufactures and Commerce. This essay is student work submitted this semester by Jonathan Edmeades, during study for the Urban Planning 100G Course administered by The School of Architecture and Planning, University of Auckland. Frank Lloyd Wright’s theory and ideas have provoked much debate over the course of the past century. Wright’s development and promotion of the principles of organic architecture, drove his belief that the modern skyscraper city was constraining the individual democratic spirit of America and provided the theoretical basis for his conceptual urban plans (Wright, 2008; Wright, 1958). The development of his ‘Broadacres’ concept, provides a conceptual insight into how Wright proposed that the process of decentralization, driven by technological advance in the areas of communication and transportation, would seek to outwork these theoretical beliefs (Le Gates et al., 2011). The legacy of Wright’s ideas is entrenched in the development of suburban cities in the post- World War II era, despite his ideas having been criticised for being too utopian in nature, resulting in his main conceptual model, ‘Broadacres’, never coming to fruition in any concrete holistic form, leaving his legacy to be considered more prophetic than directly functional (Dougherty, 1981; Le Gates et al., 2011). Lloyd Wright may not be considered to have left a distinct physical legacy upon the outcomes of urban planning in the twentieth century, but his conceptualization still provides the basis for a particular understanding of how the modern suburban metropolis has developed in the post-industrialist era. Frank Lloyd Wright was widely identified with an organic style of architecture and a belief in individual democratic spirit, values which underpinned his ideas about urban planning and form (Irigoyen, 2000; Le Gates et al., 2011). Organic design was centered on the idea that ‘form follows function’, an idea proposed by Louis Sullivan, one of Wright’s mentors (Theron, 1963, p.33). This influenced his belief that the form of a city should develop according to the opportunities brought by technological advance and that this pattern of development reflected a type of freedom that opposed theories advocating the imposition of a style of planning upon a landscape, rather than letting the style be created by the landscape (Irigoyen, 2000). This sense of freedom extended to Wright’s beliefs about democratic individual rights, with his insistence that individuals had a right to land as long as they lived on it, being his reaction to the role of land speculators, congestion and centralization in increasing housing prices, excluding people from the city and representing a failure of the capitalist system to allow the rugged individualism of traditional America by constraining the population (Alofsin, 2011). Wright’s vision of a classless society under the Broadacres system, particularly given his own stated preference for ‘creative originality’ over the imposition of political or economic philosophy, left his theories open to the criticism of being philosophically vague and utopian (Wright, 1958; Alofsin, 2011, pp. 22- 23). Wright also argued that design of cities should promote the maximization of experience rather than the ‘minimum for existence’ approach shown by other designers, leading to the failure of the city to add to the fulfillment and wellbeing of the individual as he believed it should (McCarter, 2006). Some scholars have reacted against these proposals, arguing that they implement too personal a set of lifestyle values upon the physical form of the city, with the construction of wellbeing coming from Wright’s creative interpretation being too confining and out of line with organic planning principles (Grabow, 1977). This belief in the rights of an individual to freedom of choice and opportunity, as well as his insistence against what he described as the accelerating power of the skyscraper city which he argued ‘enslaved’ Americans, led him to be associated with these traditional American values (Wright, 2008, p. 89; Wright, 1958; Le Gates et al., 2011). Organic architecture and the democratic principles of individual freedom and opportunity, played a key role in how Frank Lloyd Wright’s planning ideas were applied to conceptual planning and his predictions for change that would occur in the form of cities. Frank Lloyd Wright’s key planning ideas were largely encapsulated in his ‘Broadacres’ concept, which sought to envision how organic architectural principles and the democratic spirit might be conceptually applied to issues of urban design (Le Gates et al., 2011). The idea of decentralization acted as a response to the ‘enslavement’ of society which Wright thought the industrial skyscraper city had brought, with the allocation of one acre blocks to each household forming the hub of activity and industry in Wright’s conceptual view of the city (Wright, 2008; Wright, 1958). Alongside this, Wright proposed the zoning of the city into five sections according to their need for access to main carriageways (Grabow, 1977). Wright depicted this as having the effect of redefining societal structures by removing the wage-driven economy which the machine had developed, and which had created the skyscraper city, instead allowing a more independent lifestyle through the slowing effect of a low density, post-industrialist city and greater self-sufficiency (Wright, 1958). Wright saw the development of communication and transportation technology in the form of the automobile and the telegraph, as essential in allowing this development, reducing the need for proximity to other individuals for the purposes of communication or exchange (Le Gates et al., 2011). The reduction in the need for spatial proximity afforded economic freedom to individuals in ‘Broadacres’, with the replacement of the ‘monarchy’ of centralization for the exploitation of labour by business, with a situation where decentralization provided the basis for democratic individualism (Wright, 1958). These organic principles do however contrast with today’s contemporary analysis of the reasons for urban decentralization, where function is regarded as having had distinct impact upon the form of cities through the influence that land values and taxation have on decentralization (Wassmer, 2008; Habib et al., 2011). This variation in reality from Wright’s organic principles, signals that ‘Broadacres’ was very much conceptual in nature and was a presentation of potential outcomes from the perspective of Wright’s personal values, rather than from any positivist analysis of the causes and results of the ‘skyscraper city’ which he was criticizing (Grabow, 1977). The development of decentralization through Wright’s ‘Broadacres’ concept demonstrates the outworkings of his association with traditional American values of individual freedom and democracy in the form of cities in a way that reflects his beliefs about the factors which would impact the future development of suburbia, despite the utopian nature of this vision. The legacy of Frank Lloyd Wright is contested. Some suggest that his visions of decentralization have been the ‘evil seed’ which drove the suburban sprawl of post industrialist cities across America, while others suggested that his focus on self-sufficiency saw him as a forerunner of more environmentally friendly forms of urban development (Alofsin, 2011). While his planned community of ‘Broadacres’ has never been realized on any physically significant scale, despite attempts to convince President Franklin Roosevelt to enact it in the Great Depression era, Wright’s vision of the decentralization of the industrial city has come to pass, with the development of suburbia across the industrialised world being identified as reality in the post-World War Two era (Grabow, 1977; Dougherty, 1981). The lack of associated societal change in achieving a classless society, dominated not by a plutocratic elite, but rather a limited architect driven government as Wright proposed, creates the impression that while Wright may have predicted this change, his ideas were not the drivers of the form of this development (Alofsin, 2011; Dougherty, 1981). Norris Kelly Smith argued that the lack of political usage of these theories to drive future modes of urban development suggests that his legacy left little impact, while others have written off the societal vision of ‘Broadacres’ as utopian, however, Wright has also been suggested to have recognised the impossible nature of such a plan, suggesting that his interest lay in ‘envisioning’ changes that either would or were already occurring in the form and function of cities, placing his legacy in a prophetic rather than as a utopian light from today’s perspective (Grabow, 1977, p.199; Alofsin, 2011). From this viewpoint, we might see Frank Lloyd Wright’s legacy today as being one which correctly identified the role that the social pressures of the industrial city, and the developments of new technologies, would have in causing the decentralisation of cities across the twentieth century, rather than as a planner who failed to have any concrete impacts. The comprehensive nature of the Broadacres concept has been further criticized for its imposition of Wright’s values upon society, with his promotion of a certain lifestyle, notably that of moderate self-containment and rural living, being seen as too prescriptive for the role of a planner (Grabow, 1977). However Wright noted that the ‘Broadacres’ concept contained an element of ‘symbolism’ and ‘vision’, furthering the view that the concept held a utopian value and would fulfill more of a ‘prophetic’ role in the development of urban form than a functional role (Grabow, 1977, p.119, Dougherty, 1981, p.241). As a result, it is arguable that Frank Lloyd Wright’s legacy today lies largely with his contribution to our understanding of the development of the modern suburban city as an urban form. The ideas of Frank Lloyd Wright around planning were hallmarked by his identification with traditional American values of freedom and democracy, and the decentralization theory which epitomized, in his view at least, those values within the urban context of America. His legacy in influencing urban planning may have been one of prediction and prophesy rather than concrete outcomes, but it can none-the-less be seen as an informative critique of the social pressures created by centralization and as a possible solution to those issues. Now that the suburban decentralization of cities has largely occurred as Wright predicted, contemporary planning faces dealing with the downsides of sprawl and the new types of congestion it has brought, leaving Wright’s concepts as somewhat unfashionable. However, his commentary remains important as a means of visualizing the issues with centralization and its associated socio-economic platforms that may prevent such pressures becoming an overriding force in the outcomes of modern planners. Alofsin, A. (2011). Broadacre City—Ideal and Nemesis. American Art, 25(2), 21-25. Dougherty, J. (1981). Broadacre City: Frank Lloyd Wright's Utopia. The Centennial Review, 25(3), 239-256. Grabow, S. (1977). Frank Lloyd Wright and the American City: The Broadacres Debate. Journal of the American Institute of Planners, 43(2), 115-124. Habibi, S., & Asadi, N. (2011). Causes, results and methods of controlling urban sprawl. Procedia Engineering, 21(0), 133-141. Irigoyen, A. (2000). Frank Lloyd Wright in Brazil. The Journal of Architecture, 5(2), 137-157. Le Gates, R., Stout, F., & Wright, F. L. (2011). Broadacre city: A new community plan' from Architectural Record. The City Reader (5th ed., pp. 345-350). London: Routledge. McCarter, R. (2006). Frank Lloyd Wright. London: Reaktion Books. Theron, D. (1963). The development of American Architecture in the tradition of Louis Sullivan and Frank Lloyd Wright. Theoria: A Journal of Social and Political Theory, (21), 33-36. Wassmer, R. W. (2008). Causes of urban sprawl in the United States: Auto reliance as compared to natural evolution, flight from blight, and local revenue reliance. Journal of Policy Analysis and Management, 27(3), 536-555. Wright, F. L. (1958). The Living City. New York, USA: Horizon Press. Wright, F. L. (2008). Modern architecture: Being the Kahn Lectures for 1930. Princeton and Oxford: Princeton University Press. This essay is student work submitted this semester by Aidan Summers, during study for the Urban Planning 100G Course administered by The School of Architecture and Planning, University of Auckland. The ideas put forward by Ebenezer Howard were challenging for many to accept. They came at a time where poor health, overcrowding and poverty consumed most living in cities and required social change before their benefits could be truly realised. The legacy that he hoped to leave behind was all that he envisioned his Garden City would offer. It required the adoption of all his ideas although acknowledged that this would need to be perfected. Both work from his successors and influences on legislation keep Howard’s ideas alive however not in their entirety. Ideas which have been harder to accept have been left aside, changing Howard’s legacy over the course of time. Ebenezer Howard shocked many with his ideas presented in his self-published 1898 book "To-Morrow: A Peaceful Path to Real Reform” (Parsons and Schuyler, 2002). This was because he had never before displayed such intelligence or leadership qualities required to produce a revolutionary piece of work (Fishman, 1982). His years before publishing play an important role in understanding his key ideas and why they deviate to his legacy today. Born in 1850, Howard finished schooling at age 14 where he began working as a clerk for a stock broker’s office in London. He then tried farming in Nebraska in 1871, only to fail and move to Chicago one year later. Six years’ time brought Howard back to London where he worked as a stenographer (Parsons and Schuyler, 2002). Here he had the opportunity to learn about city problems and schemes developed to fix them (Buder, 1969). Coupled with his failure and temporary poverty experienced when farming, his work as a stenographer awakened him to social issues, in particular poverty and housing (Fishman, 1982). Howard became transfixed with these problems, attending readings and discussions to educate himself from both political and social standpoints (Parsons and Schuyler, 2002). A book titled ‘Looking Backward’ by Edward Bellamy then captivated Howard and minds alike (Hall & Ward, 1998). In his book, Bellamy spoke of the communities of the year 2000. He depicted a nation who worked for each other, the land publicly owned and all operations highly centralised (Mullin, 2000). Enthused by Bellamy’s ideas, Howard began developing models to test his work. In this time it became apparent that not all his ideas may be practical. This sparked innovation for Howard as his own ideas developed and the utopian known as the Garden City was born (Fishman, 1982). In Howard’s book, republished in 1902 under the name “Garden Cities of To-Morrow”, he illustrates his ideas in the form of a new community, named the Garden City (Buder 1969). The principle behind the Garden City is best explained by Howard’s renowned picture, the three magnets Figure 1, as shown in the appendices. The diagram depicts the city and country as two individual magnets, both of which attracting people with their benefits and detracting with their detriments. Howard’s work aimed to create a community that incorporated the benefits of both city and country while neglecting these negatives. This was described as the ‘Town-Country magnet’; attracting those living in poverty with cheaper rents and job prospects as well as industries with lower operating expenses and markets at their doorstep (Howard, 1965). In creating this third magnet, Howard believed he had the answer to social problems. Those living in poverty would be able to move into the new affordable city with job prospects and a higher standard of living. This would then aid decentralisation, reducing the overcrowding issues London was currently experiencing. It therefore improved the standard of living for all people concerned (Filler, 1986). The Garden City was however more than an answer to social issues; it was an economic and social step towards a higher stage of establishment (Fishman, 1982). This was built upon Howard’s two fundamental ideas; the community ownership of land and a connection with nature. While these ideas were in no way original, Howard never claimed they were. His innovation came from identifying what each idea or proposal offered and combining them in a way to create a successful system (Fishman, 1982). The community ownership of land was one of the most important and most troubling ideas that Howard strived to achieve (Buder, 1969). The removal of profit motivated developers enabled the community to receive the full benefit from increasing land values. The result is satisfying for the community rent remains stable with increasing land value and more funds are available to spend on public spaces. It also indirectly benefits as Howard believed cooperation or brotherhood would form, creating a stronger, more satisfied community (Buder, 1969). As the benefit remains in the community’s hands, a sense of responsibility is developed for their city which leads onto Howard’s next idea of connection with land. Like the name suggests, large gardens and ‘green belts’ would also be significant features in the Garden City. Howard saw a connection with nature as an important factor affecting people's satisfaction and future prosperity (1902). The current situation in London was a very clear example of what happens when this connection is lost with poverty, poor health and pollution evident to all. Welwyn then began being constructed in 1920 as a result of Howard’s frustration with the Letchworth community not owning their land (Filler, 1986). To fund the development Howard used his personal assets, donations and bank loans. He then formed a non-profit company called Welwyn Garden City Limited and began arranging the planning, publicising and construction of the new Garden City (Filler, 1986). Howard’s passing in 1928 left his partner, Frederic Osborn as the forefront of the Garden City movement (Osborn, 1950). Osborn shared Howard’s belief that new cities needed to be built however did not see the importance of community owned land. Because of this, instead of trying to raise interest on his own, he continued to pressure council and government officials to convert the Garden City’s approach into legislation (Fishman, 1969). Osborn therefore kept the Garden City alive and with his continual pressure had a large role in the development of the 1946 New Towns Act (Hall & Ward, 1998). The act authorised the construction of multiple new towns based on the hard work of Howard. The continual development and health of those living in Letchworth and Welwyn made them worthy models to apply to the future towns. The New Towns Act (1946) also followed Howard’s idea of leasing land to repay loans and incorporated his lower density development (Fishman, 1982). It is here that the legacy of Ebenezer Howard begins to deviate from his ideas. His two garden cities of Letchworth and Welwyn are physical examples of his ideas he worked towards and therefor serve as his legacy. Both cities have since had their land sold so his principle of the community owning the land has been removed. His name is then firmly etched into the term Garden City which greatly influenced the birth of town planning and the 1946 New Towns Act. 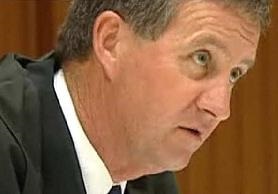 Both pieces of legislation identify that the marriage of town and country is a good way forward however once again do not acknowledge Howard’s idea of community owning the land. And now today, a garden city may simply refer to the low density city. Although individually his ideas were not original pieces of work, the innovation required to combine them and develop a conceptual city is worthy of praise. To then be the key figure in founding two cities based upon these ideas is what makes Ebenezer Howard a truly influential planner. His main ideas of community ownership of land and re connecting people with nature are key motivators behind these cities. They give an insight into what Howard worked so tirelessly to achieve. His successors and legislation have not captured this fist idea and as his two cities have also deviated from this idea; its impact has diminished over time. Howard’s Legacy today aligns closely with what has been captured in legislation. That is the marriage of country and town, or re connection of people with the land. Buder, S. (1969). Ebenezer howard: The genesis of a town planning movement. Journal of the American Institute of Planners, 35(6), 390-398. Filler, R. (1986). A history of welwyn garden city Phillimore & Co Ltd.
Fishman, R. (1982). Urban utopias in the twentieth century: Ebenezer howard, frank lloyd wright, and le corbusier MIT Press. Hall, P., & Ward, C. (1998). Sociable cities: The legacy of ebenezer howard J. Wiley. Howard, E. (1965). Garden cities of to-morrow Mit Press. Mullin, J. R. (2000). Edward bellamy's ambivalence: Can utopia be urban? Utopian Studies, , 51-65.